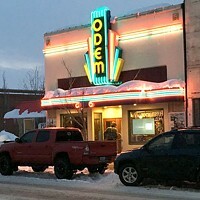 It's been a surprise novelty for people nationwide to read about this week—but here in Bend, our own Blockbuster has been our go-to for rare, old and new-release films for decades. When I called the last Blockbuster on Earth to set up a discussion with general manager Sandi Harding, a clerk had to take a message because she was in the middle of an interview with CBS. About 48 hours earlier, I was in there returning a copy of "Sicario" and buying Season 2 of "Mr. Robot" on DVD for $5. As I dodged a half-dozen people outside taking pictures, I realized my neighborhood Blockbuster was blowing up. There's something poetic about being a film critic in Bend, Ore., and living three blocks from the last Blockbuster Video in the world. I promise, I don't take it for granted. If there's a movie I can get for $1.50 from Redbox, I'll still go to the little Blockbuster and pay $4 for the pleasure of walking around a store and hunting my white whale. If it's streaming on Netflix, I'll snag a Blu-ray—since never in history has beautiful, sweet physical media ever needed to buffer. I don't want to be the old man yelling at clouds or anything, but there's no way that "Netflix and Chill" will ever supplant walking around a video store with someone you like and both reaching for a copy of "Eraserhead" at the same time. That right there, kids, that's how babies are made. The texture, the smell, the clerks with Jedi-like knowledge of cinema apocrypha... these things can never be replaced. I know some people are chuckling about the once-mighty giant that crushed the mom and pop video stores into dying an unnatural death, but you should know that the Blockbuster here in Bend is a mom and pop operation. I've been going there for close to 20 years (especially after I was fired from the Hollywood Video across town) and they've never made the spot feel like a dead-eyed corporate monstrosity. Don't let the fear overtake you, though: the end of Blockbuster isn't the end of video stores altogether. As long as places like CineFile Video in Los Angeles or Video Free Brooklyn in New York still exist, then the lost art of perfect video store curation will never die. After a decade, there will be a resurgence of love for lost cultural touchstones (I see you mounting a comeback, Drive-In Theaters) and, before we even know it, mom and pop shops will start dotting the country again. At its height around 2004, there were 9,000 Blockbusters nationwide with (according to the Washington Post's Samantha Schmidt) a 1989 peak of a new store opening every 17 hours. Booms like that never last, but it's still somewhat heartbreaking to watch your favorite type of physical media go the way of our forgotten playthings, "Toy Story 3"-style. After two of the remaining three Blockbusters—both of those in Alaska—closed last week, the Bend store is the remaining one. I've worked at so many pop culture retailers over the years that my heart has calluses on it. I was working at a video store when VHS changed over to DVD and at a record store as people quit buying CDs. I've sold popcorn at a dying movie theater and printed tickets to plays no one ever came to see. Whether our little Blockbuster can survive Netflix, Redbox and Amazon remains to be seen, but one thing is for certain: As long as this one stays open, I'll keep my card laminated.